A Jack Kelly Follow Up. 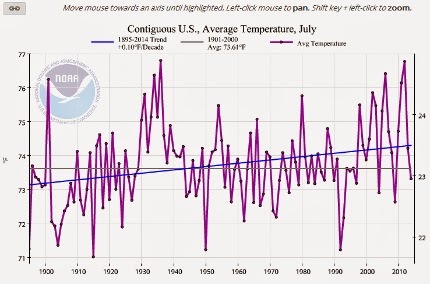 Remember my most recent debunking of Jack Kelly's most recent climate science misinformation? Take a look. I posted this at 1:58 yesterday afternoon. And today, The City Paper's Bill O'Driscoll posted this at 4:45 this afternoon - that's almost 27 hours later. Put those two things together and you've got yet another embarrassment for what the Trib calls "The Block Bugler." Climate change is as grave a threat as the Ebola virus or the terrorists of the Islamic State, Secretary of State John Kerry said in anticipation of the United Nations conference in New York last week. All but a “tiny minority” of “extreme ideologues” in the “Flat Earth Society” think the planet is warming dangerously, he said in speeches in Indonesia and Hawaii. This is going to be a teensy bit of a challenge for us as the speeches in Indonesia and Hawaii aren't actually the same speeches. Nor are they even very close chronologically. The speech in Indonesia was in February, 2014 and the speech in Hawaii was 6 months later in August. So how they both can be made in anticipation of the UN conference this week is beyond me. If Mr. Kerry were to attend a meeting of the Flat Earth Society, “his presence might lower the level of discourse,” said Myron Ebell, gobsmacked by two in particular of the many things the secretary of state said that aren’t true. ...an environmental expert for the Competitive Enterprise Institute. Ebell holds a B.A. from Colorado College and an M.S. from the London School of Economics. He also did graduate work at the University of California at San Diego and at Peterhouse, Cambridge University. Which is completely different from Hansen, and Corell who actually do have Phd degrees and actually are authorities on climate science. But hey, one man's ignorance is just as real to him as another man's science - if that first man's a science illiterate. And yet, Jack refers to Ebell as "an environmental expert" even when Ebell himself says he's not a climate scientist. Doesn't anyone at the P-G look into these things? There’s been no warming for 18 years, according to weather satellite measurements. It’s about 0.4 degrees Celsius cooler in the United States now than in 2005, says the National Oceanic and Atmospheric Administration. This year has been the chilliest since the federal government began keeping records in 1871. See that brownish line in the upper right? That's about the past 18 years. See the rest of the line? That's the trend since 1880 or so, So even if the statement "There’s been no warming for 18 years" is true, it still doesn't deny the upward trend of the past century or so. Earth has warmed by 1.5°F (0.85°C) since 1880 and most of that warming has occurred since 1976. Each of the last three decades has been warmer than the one prior—the 1990s were warmer than the 1980s and the 2000s were the warmest decade on record. [1, 2] Such a dramatic rise in temperature in three consecutive decades is a clear indicator that the globe is warming. His next two statements confuse climate with weather (if, indeed, his numbers are accurate). If it is the case that .4 degrees Celsius cooler now in that small portion of the Earths total surface called "The United States" than it was 9 years ago, so what? It says nothing about the global temperatures over a span of more than a century. Jack's insulting our intelligence if he thinks that that's even an adequate fact in this context. Doesn't anyone even both to let Jack Kelly know how wrong he is? If he wants to present his case (rather than tossing off unsubstantiated statements) let him do that. Let him present us with the peer-reviewed articles. Let him present us with the authors of those peer-reviewed articles (rather than non-scientists from CEI). In the meantime, let's not think he's actually presenting science. Let's not let him get away with thinking that he is. Warming “will make it much more difficult for farmers to be able to grow the regular things we grow,” Mr. Kerry said. Carbon dioxide is to plants what oxygen is to us. Warmer temperatures at higher latitudes extend growing seasons. More CO2 and more warmth should mean more food production. The planet’s gotten greener since 1980, satellite measurements indicate. So while John Kerry was talking about how climate change-caused heat waves and water shortages will make it more difficult for farmers in some places, Jack leaves that out to talk about CO2 and "warmer temperatures." By leaving out what Kerry actually said and then responding to the incomplete utterance, Jack's committing a logical fallacy known as the "straw man argument." Doesn't anyone at the P-G even bother with this stuff anymore? If not, why the heck not, and if so, why the heck are they letting him get away with it? I usually don't react to "Letters To The Editor" for a number of reasons. I figure that news delivery people or news commenting people should get their facts right. If they don't, then I contend I have the right to correct them in public. They should know better. But consumers of news? People who aren't paid to comment or deliver the news? I'm just not comfortable fact-checking them. Their only fault is that they're usually just feasting at the wrong table and they don't know better. The president lacks prudent judgment and common sense. Coffee cup in hand, he recently stepped off Marine One and gave the traditional military salute to the Marines strategically positioned to officially receive the commander in chief. This sloppy, halfhearted salute while holding a coffee cup in his saluting hand clearly demonstrates a disrespectful attitude toward every American veteran and all men and women now serving in the military. Certainly, a better example can be set in the future by following the official protocols and traditions of saluting and acknowledging those who faithfully serve and represent the military. Further, let's not demean and diminish the dignity, honor and respect of the office of president of the United States. It's a complaint that made its way around the sillier part of the already silly conservative media. And of the two "disrespectful" and "sloppy half-hearted" salutes, which one was proffered by a president who lied the country into a war that led directly to the deaths of 4500 servicemen and women? How many lost limbs for the WMD and the Saddam/al-Qaeda connection that simply weren't there? How much more PTSD? How much more strain on the already strained VA due to the fear mongering over how we can't wait for the smoking gun mushroom clouds? It still amazes me that the GOP throws these science illiterates onto this committee. This should embarrass any clear thinking conservative in the country. They're political party's been abducted by some otherwise intelligent people who simply refuse to use their brains. The New York Times went full-tilt boogie in its front-page coverage of “legions of demonstrators frustrated by international inaction on global warming” descending on the Big Apple on Sunday, even devoting eight photos to the rally. And that would be a legion of over 310,000, by the way. The one-day [UN] summit, preceded by a historic march that drew tens of thousands of climate activists to Manhattan streets on Sunday, occurs as scientists report that global greenhouse gas emissions rose 2.3 percent last year to record levels. In the United States, despite several recent years of decline, they rose 2.9 percent. As Steven Koonin, a former Obama administration undersecretary for science in the Energy Department, offered in Saturday's Wall Street Journal, “there isn't a useful consensus at the level of detail relevant to assessing the human influence” on climate. Yea, they also left out that Koonin at least as late as 2007 was the "Chief Scientist" for British Petroleum. Gee, they put in that he was an undersecretary for Science under the Obama administration but left out that he was a Chief Scientist for British Petroleum. I wonder why. So simply saying "no consensus" doesn't really mean there's no consensus. It took the threat of a lawsuit before the Air Force agreed on Wednesday to allow airmen to omit the phrase “So help me God” as part of a required oath. Until then, they claimed an airman stationed at Creech Air Force Base in Nevada was ineligible to reenlist after he crossed out the phrase on his reenlistment form. This controversy will rile up many people of good will—not against the military, but against the airman. Why make a big deal out of words that the majority of Americans believe in? Just cross your fingers if you must, and say the words. Why rock the boat? Here’s why: The incident betrays a subtext of intolerance and hostility toward secular people that is embedded in American culture and public institutions. The Air Force was ready to end a man’s military career because he would not submit to its religious demands. The objection to forcing the oath on nonbelievers should be obvious. It’s not. And slapping "In God We Trust" on the County Council wall? Yea, I object to that too. Secular Americans make up a huge and growing stratum of society. Atheists, agnostics, humanists, freethinkers and the nonreligious make up 20 percent of Americans overall and fully a third of Millennials under 30 years old. But until secular people come forward and introduce themselves, the misconceptions marginalizing them will persist. The polls are pretty startling. A Pew poll this year found that nearly half of Americans say it’s necessary to believe in God to be a moral person. Another recent poll found Americans would rather vote for an adulterous or pot-smoking candidate for President than one who is an atheist. Yea, cause we're Godless and all that. But a new campaign is hoping to change all that. Openly Secular launching today, is a new coalition of more than two dozen secular groups—one of the largest of its kind—coming together with the goal of raising awareness of the numbers of nonreligious people in the country. We include not only atheists and agnostics, but our allied organizations include religious people of many denominations who cherish the Founding Fathers’ ideal of church-state separation. Hello, I'm David. I'm an agnostic and I am openly secular. The Trib Editorial Board Botches The Facts. Again. 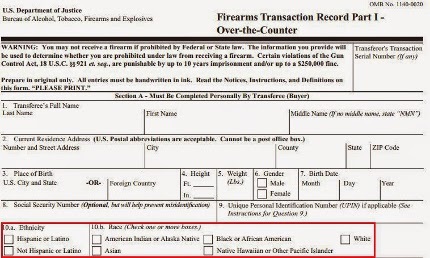 The Obama administration is mum on why, in 2012, it began requiring gun buyers to declare their ethnicity and race. But its gun-grabbing, politics-first nature should make reasonable people suspect the worst. Around the time the form changed, the administration was citing flows of U.S.-sold weapons to violent Mexican drug gangs during a gun-control push and requiring Southwest border-state dealers to report multiple rifle sales. So, was the change implemented in an attempt to better track gun runners and straw purchases? Or was it an intentional effort to trip up legitimate gun dealers and close them? And what of the mass copying? Americans deserve a full explanation. Here is the Washington Times piece they're referencing. In 2008 there was one box to fill. In 2012 there were two. Both forms asking for the same information. So how can a revised 2012 form begin something that was already in place at least 4 years before? But wait...the Wayback Machine has a sample image of form 4773 from 2001 where they ask, you got it, a question about race and ethnicity. 2001? That was like 13 years ago, right? So how badly is this sentence botched? 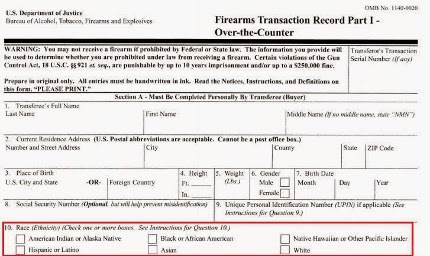 The Obama administration is mum on why, in 2012, it began requiring gun buyers to declare their ethnicity and race. Pretty bad. Anyone who claims to be a news gatherer at the Trib should feel more than a little embarrassed to be employed by an organization that can get something like this so damn wrong. How long has it been since Louisiana Governor Bobby Jindal said the GOP should stop being "the stupid party"? That was only January of 2013. Speaking at a breakfast hosted by the Christian Science Monitor, Republican governor of Louisiana and likely future presidential candidate Bobby Jindal repeatedly dodged reporters’ attempts to get an on-the-record answer to his views on that most basic of questions — whether a force called evolution led to humanity’s present form, or whether mankind was crafted mere thousands of years ago in God’s own image. How about they should be teaching scientific truth? It fits with the otherwise anti-scientific stance of his party. For example when the Pew Research Center asked about evolution, 48% (or nearly half) of Republicans abandoned science and said that humans have existed in their present form (ie did not evolve over time - with or without Divine guidance). I guess the opening question to any Republican you meet should be, "Do you agree with science or are you a creationist?" If only to get a feel for how much of teh crazie has infected the room. All humans are created equal, but not all ideas are. Ideas have consequences, and the consequences of secular atheism are appalling. As the 20th century demonstrated, societies based on a vaguer, God-free foundation of “human rights” tend to have slaughtered hundreds of millions of those humans. Yes, that's right. It was Atheism that drove Stalin, Mao and Pol Pot to slaughter all those people. A God-free foundation of "human rights" is the culprit. So when "our cause is just" and with God on our side, we must conquer. See the trouble now? Look around. In this week's Post-Gazette, there's another column by Jack Kelly that clearly shows, yet again, that no one over there on the Boulevard of the Allies adequately fact-checks Jack Kelly. But then again, we've known this for years. Even the most forgiving judge of Barack Obama, one willing to overlook his preference for chipping onto the sunlit greens of Martha’s Vineyard rather than brooding in the fluorescent glare of the Situation Room, must admit that the President has sometimes been a thick-tongued steward of his own foreign policy. It’s kosher to criticize Sen. Paul’s foreign policy views, to suspect expediency motivated the recent shift in them and to consider his inexperience in foreign affairs a handicap. (I have, I do and I do.) But to attack him for his charitable work is vile. I'm not exactly sure that Remnick is attacking Paul simply for his charitable work. Looks more like he's pointing out Paul's use of the charitable eye-surgeries as some sort of political photo-op (in this case, to bolster some sort of foreign policy credibility). And that is something to at the very least be cynical about. ...Bossie’s presence cast aside any doubt that the trip was merely an opportunity for the senator to reconnect with his medical roots. Bossie is the founder of Citizens United, the group whose lawsuit led the U.S. Supreme Court to rule that corporations and labor unions can spend unlimited funds on direct advocacy for or against political candidates. A documentary filmmaker who has shadowed Paul before, he traveled here with his daughter and a film crew equipped with lights, cameras and an unmanned aerial drone for overhead shots. Bossie said little about his plans, other than that his footage would appear in a film either about Paul or an issue of importance to him. Paul’s entourage included family members and friends; his top political aide, Doug Stafford; and political ad makers Rex Elsass and Rick Tyler, the latter a former close aide to Newt Gingrich. The ad team was joined by a Spanish-speaking colleague who was responsible for trailing behind another film crew with legal release forms that needed to be signed by anyone interviewed or appearing in their footage. It wasn't clear whether Guatemalans presented with the release forms understood what they were signing. So it wasn't a purely charitable trip then, was it? Now go back and look at how Jack Kelly characterized Remnick's description of the trip. Wouldn't it have been much better to know more of the details before reading that it was "vile"? That's the set of facts that Jack left out - the stuff he doesn't think you need to know about before reading his opinion. Mr. Remnick’s snark is sustained only by his ignorance of or disregard for facts. The invasion of Iraq was a cakewalk. Saddam Hussein’s regime was ousted 21 days after the U.S. coalition attacked. Just 172 coalition soldiers were killed. The Six Day War between Israel and Arab states in 1967 probably was the only victory in the history of warfare won more swiftly or easily. The troubles came during the occupation afterward, which Mr. Rumsfeld — who wanted the United States to set up a coalition government and then leave — had opposed. So Jack is saying that Rumsfeld wasn't wrong to say that the invasion would be "a cakewalk" right? Jack then foils that with Rumsfeld's opposition to the Iraq occupation. So Remnick must be wrong, right? But let's be sure. Was it Rumsfeld or Adelman who said the invasion would be "a cakewalk"? So whose "ignorance of or disregard for facts" are we talking about when Jack said (incorrectly) that Rumsfeld said the invasion of Iraq was (and Jack even used the quotation marks) "a cakewalk"? Doesn't anyone at the Post-Gazette fact-check Jack Kelly? Evidently not. Lance: To Rich Fitzgerald. The Allegheny County chief executive appears to think that Jews, Hindus, Buddhists, Muslims and Islamics don't believe in God. That's the take-away from his opposition to a County Council proposal, defeated Tuesday, to post “In God We Trust” in the council's meeting room. Mr. Fitzgerald said that would send a message to non-Christians that they're not welcome. He didn't have many takers among that cohort. One of the area in which we could do better is our diversity. It’s the reason that organizations like Vibrant Pittsburgh were created, the reason that Allegheny County become a “Welcoming County,” and the reason that we continue to participate in efforts and initiatives that express that we are a friendly community that welcomes everyone. One area in which we could do better is our diversity. See? My guess is that in the memo writer's haste this error was made. And then in the second phrase of the second sentence, the memo writer probably should have gone with the present perfect ("the reason that Allegheny County has become...") or maybe the simple past tense ("the reason that Allegheny County became...") rather than what's there ("the reason that Allegheny County become..."). Support and passage of 8376-14 tells our residents and visitors that if they are Jewish, Hindu, Buddhist, Athiest, Muslim, Islamic or any other non-theistic group, they are not welcomed here. Support and passage of 8376-14 tells our residents and visitors that if they are Jewish, Hindu, Buddhist, Muslim, Islamic, Atheist or any other non-theistic group, they are not welcomed here. See? By grouping it that way, it's clear who makes up the non-theistic groups are and who doesn't. Context, convention and circumstance are all. A little editing by the County Executive's office would have left the Trib braintrust little grammatical room to snark. Special note to County Executive Rich Fitzgerald: It's spelled atheist and not athiest. With the Steelers and Pirates both playing tonight. I'm thinking my audience will be dominated by women tonight. How about we talk fall/pumpkin recipes? Who's in? You are encouraged to post recipes and pics here. A few commentors pondered the inherent sexism of the status update. I'll leave it to y'inz to ponder it for yourselves. Perhaps it was a joke. Perhaps he was being ironic or maybe even postmodern. Who knows? I certainly don't. And lastly I accuse us. All of us - executives, players, fans, reporters - of failing to draw a line in the sand when one was needed most. Any games played by Baltimore without its executives, and the commissioner having been dismissed and without Ray Rice being permanently banned by the National Football League must be fully boycotted by all of us. If not, we become accessories after the fact. And Ginny - who may not be boycotting only tonight's game. Labels: Keith Olbermann, NFL, Pittgirl, Ray Rice. I watched the vote. As far as I can tell (and this is OF COURSE subject to verification) Allegheny County Council voted 8-6 AGAINST the "In God We Trust" legislation. Freedom won today. Yes, it did. Allegheny County Council members rejected a proposal to post “In God We Trust” in the county courthouse on Tuesday. Council members voted 6-8. [Council Member Sue] Means, of Bethel Park proposed posting the motto and has said it is not a religious phrase but a historical one. "In God We Trust" isn't religious? In what universe? In case you were wondering who is trying to influence Allegheny County Council on the "In God We Trust" matter, here are letters from Liberty Counsel and the Freedom From Religion Foundation that made their way to that body. Personally, I believe that most politicians already have their mind made up one way or another on this issue and use letters like this to cover their asses. In fact, these letters were sent to a constituent--and reader of this blog--who emailed and called his/her counselor today. That counselor took the Liberty Counsel position. However, while counselors may have their own beliefs on this topic, one thing that sways them more than any lobbying group (well, when there's no $ involved anyway) is voters inundating them with calls and email. So keep it up! Last chance to voice your opinion before County Council votes today! Allegheny County Council will vote today at their 5:00 pm meeting on a resolution--Bill 8376-14--proposed by Councilwoman Sue Means (R-Bethel Park), to post a plaque displaying the words “In God We Trust” in the Allegheny County Courthouse Gold Room. If like the Post-Gazette editorial board you believe that doing so will "invite discord," or like Allegheny County Executive Rich Fitzgerald you believe that doing so is "disrespecting other religions and beliefs by promoting one above the others," or like blogger Sue Kerr you believe that you "cannot trust the people who profess to believe in God," or like the OPJ you want to know "who is the 'we' here," or like this Facebook group (and bill critic Audrey Glickman) you believe that the stated purpose of the plaque in honoring "historic" and "patriotic" sentiments is pure BALONEY, then you have a little less than 12 hours to make your beliefs known to County Council. 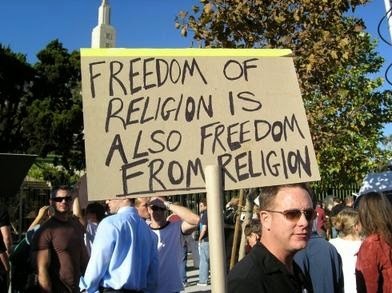 Let's flood their in-boxes and voice-mail and let them know that we believe in the Separation of Church and State! Remember this from a scant 24 hours ago? ...would exercise his veto power if County Council passed legislation to post the motto “In God We Trust” in the courthouse, Mr. Fitzgerald told council members Monday. Councilwoman Sue Means, a Bethel Park Republican, has driven the push for the national motto to be displayed in the Gold Room of the courthouse, where council conducts its twice-monthly meetings. Ms. Means, who says she is an evangelical Christian, wants to see “In God We Trust” installed above a replica of the Bill of Rights. And obviously this legislation from this evangelical Christian has nothing what so ever to do with pushing religion into the legislative process. Nope. Not here. Never. Look elsewhere for that. Over the last three years, our region has experienced economic growth, population growth and the return of a vibrancy in our communities that is contagious. One of the area in which we could do better is our diversity. It’s the reason that organizations like Vibrant Pittsburgh were created, the reason that Allegheny County become a “Welcoming County,” and the reason that we continue to participate in efforts and initiatives that express that we are a friendly community that welcomes everyone. A diverse population allows for different viewpoints and ways of life to be expressed. As a community, we should value the characteristics that make each person unique, rather than spending time on decisions that would communicate the exact opposite. He included this P-G editorial and referenced this Trib piece. Good for County Executive Rich Fitzgerald. Let's hope the Council does the right thing and votes this legislation down. What Do You Mean "We"? Who Is the "We" Here? At a Committee on Government Reform meeting Thursday night, the group decided 5-1 to present council at its Sept. 9 meeting with an amended resolution that would display that motto, among others, on a plaque in the Gold Room, located on the fourth floor of the courthouse, 436 Grant St.
To be sure, “In God We Trust” has been the nation’s motto since 1956 and there’s no suggestion that it be stricken from the currency or otherwise banished. But to introduce it now in an age much more pluralistic is to invite discord. The Allegheny County Council in Pittsburgh, Pa., will vote on Sept. 9 on whether to post a plaque declaring “In God We Trust” in the Gold Room of the County Courthouse. The proposal is sponsored by Councilwoman Sue Means, who insists that the motto is “patriotic,” thereby inappropriately suggesting a religious litmus test for good citizenship. Ah, Rick Saccone. Remember him? He wanted to pass a law stating that 2012 was, for Pennsylvania, The Year Of The Bible. He also thinks waterboarding's a grand idea. So now we know with what we are dealing. All that being said, my question here is, "Who are they referencing in the motto 'In God We Trust' - for whom, exactly, does the motto speak? All the citizens of Allegheny County? The individual members of the council who sponsored the resolution? One of the most widely noted findings from the American Religious Identification Survey (ARIS 2008), which was released in March 2009, was the substantial increase in the No Religion segment of the U.S. population, whom we designate as “Nones.” The Nones increased from 8.1% of the U.S. adult population in 1990 to 15% in 2008 and from 14 to 34 million adults. Their numbers far exceed the combined total of all the non-Christian religious groups in the U.S.
Who exactly are the Nones? “None” is not a movement, but a label for a diverse group of people who do not identify with any of the myriad of religious options in the American religious marketplace – the irreligious, the unreligious, the anti-religious, and the anti-clerical. Some believe in God; some do not. Some may participate occasionally in religious rituals; others never will. So what are the numbers involved here? The above says that report estimates that 15% of the population are "nones." On page 11 of the report, it says that 42% of that 15% is either "atheist" "hard agnostic" or "soft agnostic" (defined as "there is no such thing [as God]", "there is no way to know [if there is a God]", or "I'm not sure [if there is a God]", respectively). Page 19 of the report says that Pennsylvania is about in line with the percentage of "nones" in the state compared to the overall United States (15%). If we can extrapolate, that means that there's a pretty good chance that a little more than 6.3% (42% of 15%) of Pennsylvanians do not hold the belief that there is a God (they either know there isn't or aren't sure there is). If the population of Allegheny County is 1.23 million and the percentage of 6.3% of non-theists holds true, then about seventy-seven thousand Allegheny County citizens simply aren't represented in the "we" of "In God We Trust." That's more than would fit into Heinz Field. In fact it's about double the number of people who would fit in PNC Park. So it can't be representative of ALL of Allegheny County, can it? And yet it's to be nailed to the wall of the County's legislative body. So is it just the council? But then why attach it to the wall for all citizens to see? For the non-theists of the county (and I count myself as one of them) would we be truly welcome as a full citizen in council chambers? Tell me again how declaring "In God We Trust" doesn't interfere with a non-believer's right to conscience? Stop focusing on signage and instead focus on being people of good conscience who act according to their personal values – practice Christianity all you want, feed the hungry, heal the sick, answer your email, etc. But please stop imposing Christianity on your non-Christian constituents simply because they are a numerical minority. That is wrong. The OPJ started this blog on September 6, 2004. Though to be honest my participation didn't begin until 3 days later. My first blog post here was on the documents at the AWOL project supporting the assertion that George W. Bush failed to complete his National Guard responsibilities. At that point that was about the biggest blotch on his otherwise blotchy reputation. This is before the impeach worthy warrant wiretap story hit and before the waterboarding war crimes story hit. 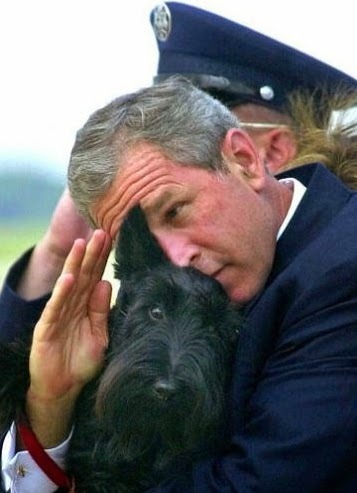 Up until that point all Dubya had going for him was deserting the National Guard and yet still being able to snag an Honorable Discharge. That being said, I'd like to wish Maria Lupinacci, the OPJ, a happy blogger birthday! Yep. The Tribune Review's editorial board is still trying to disuade its loyal readership of the established science. Note to the braintrust: Simply repeating your past assertions won't ever make them true. Let's take them one by one, shall we? U.S. temperatures haven't risen in a decade. Global temperatures have been flat for 17 years. 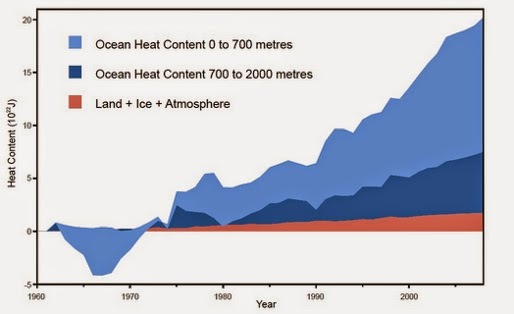 “Globally averaged surface temperature has slowed down. I wouldn’t say it’s paused. It depends on the datasets you look at. If you look at datasets that include the Arctic, it is clear that global temperatures are still increasing,”[Professor Tim Palmer of Oxford University, one of the report’s main authors] said. Simply repeating the same old selected evidence (there's been no warming since the '98 spike!) doesn't do anything to contradict any of the science. I am a trumpet player (however adept I am with the trumpet is, as always, up for debate) and my university degree is in music. Trumpet performance, some music theory and lotsa musicology. Every now and then, I'll sift through Wikipedia on a given date to see who was born then. It's always interesting to see the diverse musicians born on the same date (though not, of course, in the same year). Yea and now you know. And now you have today's earworm. You're welcome. I had a musicology professor once praised Pachelbel with this line, "Johann Pachelbel - first rate composer, despite that bloody canon!" Take a look on the panel. Between Dorothy Kilgallen and Arlene Francis sits none other than Allen Stewart Konigsberg. Don't know who Gloria Estefan is? Are you kidding me? Where have you been for the last 3 decades or so? Lotsa other interesting people born today as well. But then again lotsa interesting people born EVERY day.